Today's post is the first in a HOW TO series that will be coming over the next few weeks here at Trashless in Toronto! With Bulk Barn launching their Reusable Container Program ((TODAY! YAY! )), I feel like it's a great time to go through how to easily shop at this Canadian-born, and now zero-waste friendly, store! Guest-writing today is Ambar, one of my best friends! Ambar has been a wonderful friend and supporter on my zero-waste journey - we've had a blast exploring the city for sustainable solutions and she is has been the secret weapon responsible for bringing my vision for TinT's website to life. I'll leave it to Ambar to kick things off! Fast forward about 8 months later and my prayers were answered - Bulk Barn launched their "Reusable Container Program", allowing customers to bring their own jars or containers from home to be filled at any Bulk Barn location! It's been an awesome move towards supporting their customers' efforts to reduce their carbon footprint, and as the program is rolled out across the nation today it seems to be a true zero waste win! 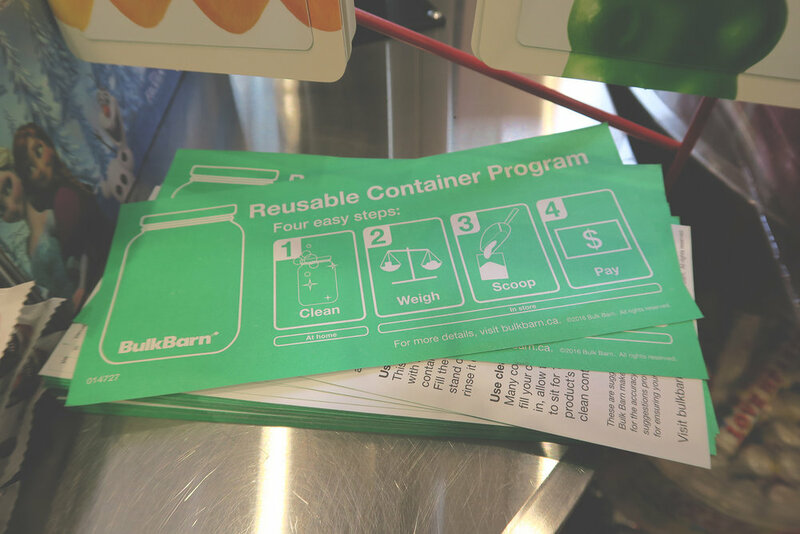 What follows is a step-by-step guide to shopping zero-waste and stress free at Bulk Barn. It is kind of self-explanatory but trust me, the cashiers do check if the container is clean and so they should. It means that Bulk Barn can trust us, the consumers, to use our own containers. You could also buy some of the Bulk Barn branded jars - but using ones you already have at home or finding jars second hand is the more sustainable route! This step is very important. You must tare your container because the cashier will most likely need to empty out your jar if you don't tare it so they can record the tare weight because they're nice people and don't want you to pay x amount for the weight of your jar. Cloth bags may not necessarily need to be tared- it just depends if the cloth is heavy or not. Also they will put a sticker on your jar with the tare weight. Try and leave the sticker on if you can for your next trip, as it saves having to use another one each time and also saves you the trouble of getting your jar tared every time! I've become a regular at my Bulk Barn and recently had a conversation with the cashier who said that since they see me so often I could just write the tare on the jar in permanent marker rather than having them re-tare and put the sticker on each time. 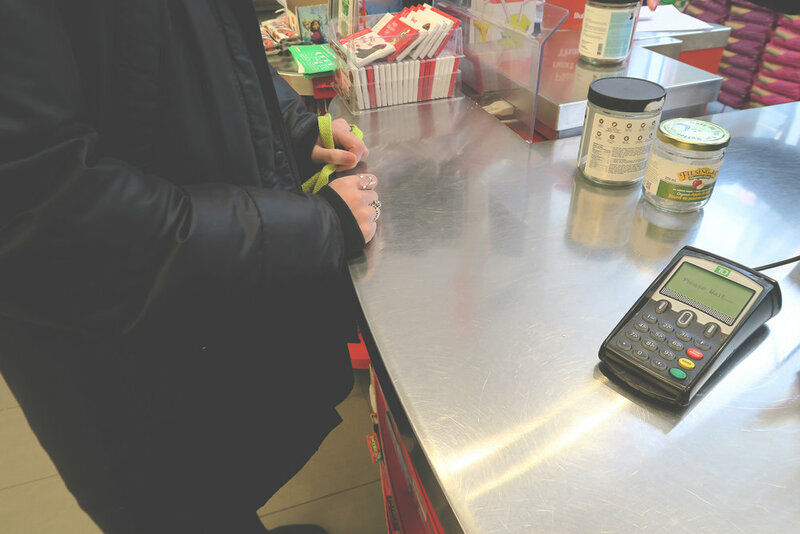 After you get the hang of your zero waste bulk shop, go ahead and talk with your cashier - it's worth the conversation and could allow you to skip the stickers and possibly even this step! Again, also very self-explanatory - but, fair warning, scooping can get tricky if you're getting peanut butter/oil or any kind of liquid that isn't easily dispensable. You can always bring a rag with you to wipe up any messes and choose wide-mouth jars to make it easier. The PLU code is the product code on every bin label. I probably do this 3 out of 10 times because I just straight up forget. Plus the staff are pretty damn good at remembering a lot of the codes. But, the best way to record the code is to just take a picture on your phone! You could also just try and remember the code which never really works for me because I don't even remember half the things I bought. Probably the easiest step of them all. The cashier does all the work at this point. They will weigh your container and subtract the tare weight so you only pay for the total weight of the goods you're purchasing. They will ask for the code/PLU code and this is when you will read it out to them from your phone or from memory for those of you with mad skills. Most of the staff are amazing though and just know the PLU codes off the top of their head! You've just shopped zero waste at Bulk Barn! Unfortunately the machine automatically prints the receipt, so until Bulk Barn changes that set up on their cash system, the receipt is the only bit of trash created. It really isn't that hard to shop with minimal waste and it becomes routine after a little while. Thank you Bulk Barn for making this a possibility! As one of the largest bulk food stores in Canada, it's a huge win for people who are trying to significantly reduce their trash making the world a better and less trash-y place.